"Did you know that after military dogs retire, they can be adopted into regular civilian families?..." Pixie and Brutus is a 2018 webcomic by Ben Hed. Pixie, a sweet, energetic kitten, meets new pet Brutus, a German Shepherd who has a military background. Brutus quickly takes Pixie under his protection, and the two develop a strange bond. For another work by the same author taking place in the same universe, see Lola And Mr Wrinkles. The collection of the comic strips (done as individual images) can be found on Facebook, here. Accessory-Wearing Cartoon Animal: Around the first Halloween strip, Pixie begins wearing a red bandanna. Angry Guard Dog: Downplayed; Brutus never enters a fight, but he's an ex-military dog who applies his protectiveness to his new position and especially to Pixie. Played for Laughs. Pixie is absolutely distraught at the notion that she might have hurt Brutus after she playfully throws a tiny toy batarang at him that doesn't even make him flinch. In another comic, she makes sure to ask Randal the raccoon if he's okay after she "tackled" him while playing cops-and-robbers (i.e. she leapt harmlessly onto Randal's back, Brutus growled menacingly at him, and the raccoon hastily played along and pretended Pixie "got" him). Attention Deficit... Ooh, Shiny! : Pixie's passion for splashing in puddles quickly overrides her memory that she has to figure out how deep water is before diving into it. Luckily, Brutus acts as a lifeguard. Art Evolution: Pixie (As seen in the page image) started out as a brownish-gray kitten. As the comic went on, she gained a bandanna and her fur became a more saturated sandy color. Bait-and-Switch: While sitting by an impressive snow lion (complete with stick mane), Pixie calls to Brutus to come see her masterpiece...and it turns out the snow lion is quite a bit less realistic and impressive than it was in her mind. Befriending the Enemy: When Brutus asks her to show what she would do if a large, mean animal tried to attack her, Pixie asks the mean animal (really a teddy bear) to be friends instead. Big Brother Instinct: Brutus takes his role as Pixie's "new big brother" very seriously. If anything could possibly hurt or upset her, he's on-guard against it. Blunt Metaphors Trauma: In one crossover with Lola And Mr Wrinkles, Brutus asks Pixie about Hugo's problems with being bullied. Pixie says Randall messes with him a lot and Lola thinks it's because Hugo is a "marshmallow", which she interprets as referring to his brown-and-white coat. Brutus tries to explain the real meaning of the metaphor to Pixie, only for her to misinterpret every attempt to rephrase it. Brooding Boy, Gentle Girl: Brutus presumably saw a lot of nasty things in his military career and continues to be fairly dark and gruff. Pixie is a sweet little kitten who tries to make friends with everybody, happily offers to share her bed with Brutus, and apologizes for pouncing (which she's apparently unaware is too minor to hurt). Brutal Honesty: In their first meeting, Brutus very quickly points out that Pixie is small, weak, and unable to protect herself. She doesn't get offended. Can't Use Stairs: Downplayed; Pixie sees the stairs as a dangerous part of the house that could lead to injury if you're not careful thanks to her small size. Brutus, of course, is unfazed. Cat/Dog Dichotomy: Pixie, the cat, is everything Brutus, the dog, is not; she's small, cheerful, naive, hyperactive, and affectionate. Brutus, meanwhile, is big, straight-laced, deadpan, unflappable, and gruff. Brutus served in the military; Pixie's never been further than her front yard, and the most dangerous thing she's ever encountered is the stairs. The Animal Jingoism part, however, is entirely averted; they get along famously. Catch-Phrase: Pixie says "Wowee!" when she's excited about something. Cats Are Mean: Inverted. Pixie is the sweetest, most affectionate kitty you could ever hope to meet. Cats Hate Water: Inverted; Pixie loves to play in puddles. Her eagerness sometimes means Brutus has to pull her out of water she splashed into before realizing it went over her head. Comically Missing the Point: A large part of Pixie's character is her innocence making her misunderstand some things the rougher Brutus says. Brutus' implied threat against Randal the raccoon goes straight over her head as she gets sidetracked by the fact that Brutus isn't striped. She completely misses the point of Brutus' training, attempting to make friends with the "mean critter" target (a teddy bear) and protesting Brutus' instructions to bite because biting would make him not want to be friends. The Comically Serious: A large part of the comic's humor comes from Brutus continuing to act like a military dog in the much friendlier setting of a normal house, especially when contrasted with Pixie's innocence and enthusiasm. Compliment Backfire: Seeing a picture of rookie Brutus, Pixie gushes about how cute and small he used to be. Brutus immediately becomes flustered and protests that he couldn't help it. Coordinated Clothes: A platonic version; Pixie talks Brutus into doing a best friends costume set with her. Brutus turns down the idea of being a flower and a bee or the princess and the pea, but agrees to Batman and Robin...only to find himself stuck as Robin, much to his chagrin. Crossover: One strip shows Lola and Mr. Whiskers coming over to wish their new neighbor Brutus a Merry Christmas...and quickly being scared off by his intimidating demeanor. Cute Kitten: Pixie is designed to be as cute as possible, with big eyes and an innocent demeanor. While Brutus doesn't go into full Cuteness Proximity, he has a soft spot for her. Dark and Troubled Past: The comic hasn't delved much into it (yet), but Brutus obviously saw a lot of not-so-nice things when he was a military dog. Pixie is so innocent and sheltered, she doesn't even understand what the military is, much less what Brutus would've witnessed in war. Dark Is Not Evil: Brutus wears an almost-perpetual frown, has two nasty facial scars, and took part in some form of combat. Upon meeting him for the first time, Lola and Mr. Wrinkles are shaken, and Lola says that Brutus looks like he breakfasts on nails. However, he easily falls into the role of sweet, protective big brother to Pixie. Deadpan Snarker: Brutus sometimes has to resort to this, at least internally, whenever Pixie isn't understanding what he's trying to explain to her. Death Glare: Brutus delivers one to Randal the Raccoon upon finding out he threatened Pixie. Delayed Reaction: Brutus, trying to take a nap, initially responds without much thought to Pixie trying to show him a movie she found, "Nighttime on Elmo Street". A few seconds after she confirms that one guy's name is "Freddy Krueger", Brutus snaps awake and smashes the screen just in time to prevent her from seeing a bloodbath. At the beginning of one strip, Pixie points out Randal the raccoon, before helpfully adding that he's a raccoon. While playing "police officer", Pixie calls Randal a bad guy, and says he's going to bad guy prison. 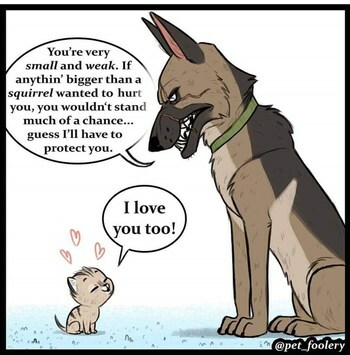 Brutus fits very well within the stereotypical role of a German Shepherd, being one of the heroes who underwent awesome military training and now defends Pixie against anything that could harm her. However, given the story's calm setting, he doesn't actually have a lot to do and his attitude gets played for laughs. A Chihuahua that appears in one strip also fits the breed stereotype, aggressively ordering the much larger Brutus off his lawn, threatening to beat him up, and dropping Gratuitous Spanish words. Dogs Are Dumb: Oh-so-averted. Brutus is way more on top of things than Pixie, and overall comes off as extremely smart. Truth in Television; military service dogs have to be smart in order to pass their training, let alone actually serve in the field. Entertainingly Wrong: Some of Pixie's ramblings to Brutus, who will occasionally play them off with a Sure, Let's Go with That kind of reaction. Evil Eyebrows: In one strip where Brutus tries to teach Pixie self-defense, he draws heavy, slanted eyebrows on a teddy bear before the lesson to make it look more menacing. Explain, Explain... Oh, Crap! : Half-asleep, Brutus reflexively corrects "Freddy Cougar" to "Freddy Krueger". In the next panel, Brutus snaps wide awake as it sinks in that Pixie's innocence is about to be ruined by the horror film. Extra Eyes: Pixie's Halloween costume is a multi-eyed...something. Eye Scream: What happened to Brutus' eye remains unexplained but he bears a scar over it and the eye beneath is clouded, implying he was injured there somehow. The Faceless: Pixie and Brutus' owner appears in one panel, shown from the neck down (probably because the panel is drawn from Pixie's perspective). Face of a Thug: Brutus' face is proof that the boy has seen some... stuff, but he is very calm and patient with his hyperactive new little sister. The neighbors' pets take a while to get used to it. Lola: You must be our— [Brutus turns to face them] ...new ...n-neighbor. Female Feline, Male Mutt: Pixie, the kitten, is female while Brutus, a German Shepherd, is male. Forgot About His Powers: Pixie has a mundane version when she needs to be reminded that, as a cat, she has claws. She's completely wowed when they pop out. Happily Adopted: A given, since they're pets, but Pixie and Brutus are both happy to be in their family, and to have each other as siblings. Heroic Dog: Brutus. He used to serve in the military, losing the use of one of his eyes for his trouble, and now he's the personal bodyguard to an adorable kitten. Pixie tries to get Brutus to explain what war is after hearing their owner call Brutus a "Military Working Dog", and Brutus stalls for some time and then tells her militaries play games with each other. In a strip where Brutus takes down a hawk, he shows her one of its feathers. She gushes excitedly and asks him where he got it. Brutus hesitates briefly before saying he just found it lying there. Huge Guy, Tiny Girl: Brutus is a large, athletic German Shepherd (and they can get to be up to 80 pounds as adults), and his little sister Pixie is a tiny kitten that can't weigh more than a few pounds. Implied Death Threat: Downplayed; after Pixie warns him against messing with Randal, Brutus says that that would be wise because Randal would likely tear his stripy tail off. Pixie doesn't get the threat, but Randal does. Innocent Blue Eyes: Pixie's sclera are colored a light blue. This enhances her endearing appearance and underlines her friendly, innocent personality. Innocent Inaccurate: During one Halloween strip, Pixie starts watching A Nightmare on Elm Street , thinking that it's about a group of kids playing hide and seek with a man called "Freddy Cougar". Luckily Brutus figured out what was actually happening and took steps to protect her from the movie's content. Kidnapping Bird of Prey: One comic opens with a hawk swooping down to grab the oblivious Pixie as she admires a flower...only for Brutus to grab it in his mouth mid-swoop and carry it off-panel. Loud Gulp: Randal lets out an audible gulp after hearing Brutus' threat. Moe Couplet: The titular duo. Their dynamic is designed to be as cute and "d'awwwww"-inducing as possible. Morality Pet: As tough and scary-looking as he is, Brutus' immediate thought process upon meeting Pixie is, "She doesn't stand a chance against attackers. Well, looks like I have to protect her, then." The Napoleon: In one strip, Brutus meets a very aggressive Chihuahua, who threatens him if he doesn't get out of his yard and then lunges at him. Of course, Brutus easily fends off the attack. Randal gets wide-eyed and starts trembling when he realizes that the kitten he drove away with threats now has a very protective canine big brother, who just made an ever-so-subtle threat about ripping his tail off. Brutus, trying to take a nap, only half-pays attention as Pixie tries to get him to come see a movie she found on TV, Nighttime on Elmo Street. Then she says that one of the guys in the movie is called "Freddy Krueger". Brutus' eyes snap wide open as he realizes what movie Pixie is watching. A hawk's facial expression shifts in the space of one panel from quietly menacing to alarmed when it tries to attack Pixie, only to find itself snared in Brutus' jaws mid-swoop. Odd Couple: Pixie is a sweet, naive kitten and Brutus is a gruff, semi-aggressive ex-military dog. Pixie still adores her "big brother" and Brutus protects her and sometimes even plays along with her. Papa Wolf: Appearances notwithstanding, Brutus is actually normally quite laid-back, despite the horrors he's clearly seen - he is in retirement, after all. The one thing, however, that will piss him off is if Pixie is ever in danger. Ask Randal about that. Perpetual Frowner: Brutus' default expression screams 'piss me off and die', though Pixie can sometimes bring a small smile to his face. Platonic Declaration of Love: Pixie declares that she loves Brutus almost immediately after meeting him, directly after calling him her big brother and squealing that they're going to be the best of friends. Protectorate: Brutus quickly realizes that Pixie doesn't have the size or strength to take care of herself in a fight, so he takes on the responsibility of protecting her and teaching her to protect herself. In other strips he protects her innocence by making sure she doesn't find out about the nastier aspects of war and R-rated horror films. Rascally Raccoon: Randal the raccoon, seen in one strip, threatened Pixie into backing off when she tried to make friends. Brutus quickly scares the stripes off him. Red Oni, Blue Oni: Bubbly, hyperactive, curious Pixie is the red. Stoic, intimidating, unflappable Brutus is the blue. Retired Badass: Brutus is a former military dog, and his scars indicate he's definitely got some combat under his belt. However, he's now retired to a nice suburban home. Rugged Scar: Brutus has scars across his eye and muzzle and an ear notch. It fits considering he used to work as a military dog before retiring and joining Pixie's family. Savvy Guy, Energetic Girl: Brutus is the worldly, grizzled veteran to Pixie's cheerful, naive kitten. Scared of What's Behind You: Pixie jumps on Randal during a game of "cops and robbers" and then asks if he's all right, thinking she knocked him over with the force of her tackle. Actually, he flopped over to appease Brutus. Seen It All: Brutus simply cannot be fazed; he was in the military, after all. Semper Fi: Based on his handler's T-shirt, Brutus was in the Marine Corps. So Proud of You: At the end of one strip, Pixie has successfully "arrested" a "criminal" (Randal). Brutus watches with a half-smile and the words "so proud" are written in the comic. Spiders Are Scary: Mentioned in one strip, in which Pixie finds a spider and compliments it on a pretty web. The spider first becomes confused and then tearful when she doesn't freak out about it. Sugar-and-Ice Personality: Brutus is hardened by his service in the military and seems outwardly cold at a first glance, but he absolutely cares for Pixie. Randal begins sweating when he realizes the trouble he's gotten himself into with Pixie's new (and very intimidating) big brother by threatening to bite her. Brutus starts to sweat as he tries to think of a way around explaining war to Pixie. Used to Be a Sweet Kid: A picture of Brutus as a rookie has Pixie excitedly remark how small and cute he was, and Brutus reluctantly agrees after trying to brush it off as him being a puppy back then. When Pixie asks about the other person in the picture, Brutus says that it was his former handler Sgt. Sergio Castillo. Pixie tells him he looks like a nice guy, Brutus says that he was. Use Your Head: In one Halloween strip, Brutus smashes the television set with his head to prevent Pixie from seeing the carnage after she innocently begins watching A Nightmare on Elm Street. Wide Eyes and Shrunken Irises: Randal the raccoon's fear after hearing Brutus threaten him comes across clearly thanks to very big eyes and pinpoint irises.